Treated Rubies & Misrepresenting What You’re Selling? Put lipstick on a rock & call it ruby! This article has been submitted to the AGA courtesy of Craig Lynch, AGA Board Member (Ouellet & Lynch), with an introduction by Board Member Antoinette Matlins. All research described below was done by Lynch; Matlins was active in determining the extent of the problem among retailers and other vendors. For thousands of years, the ruby has been considered one of the most valuable gemstones on Earth. A fine ruby (i) has everything a precious stone should have: magnificent color, excellent hardness and overall durability, outstanding brilliance, and extreme rarity. Such stones command high prices, and the finest and rarest rubies cost more than sapphires, emeralds, or the finest colorless diamonds in comparable sizes. Today, however, an increasing number of people—both in America and abroad—are finding that the "ruby" they have purchased is not what they thought it was. In fact, they are nothing more than a mixture of very poor quality corundum (the mineral known as "ruby" only when it occurs in a red color) held together by tinted lead-glass. They are created from opaque to semi-opaque rocks containing corundum and other minerals in which the extraneous minerals are leeched out by a chemical process, leaving numerous voids that are then infused with glass. In the composites now being seen by gemologists and laboratories, the glass component typically comprises 30-40% of the stone, or more! Some labs are now describing such stones as "composite ruby" and many have been found to contain more glass than anything else. While "composite stones" have been around for hundreds of years, these are produced in a different manner than old-fashioned composite stones, and as a result, went undetected until recently. Most gemologists are also calling them "composites" and think they should be classified as imitations. According to The World Jewellery Confederation known as CIBJO (an affiliation of organizations from 40 nations and whose mission is, among other things, to protect consumers), composite stones are "artificial products composed of two or more, previously separate, parts or layers assembled by bonding or other artificial methods." While these new composites don't fit this description as understood historically, given the percentage of glass present in the finished product, these rubies are clearly "composed" of two separate parts: corundum and glass, albeit, not 2 "single" separate parts. Nonetheless, how can they be considered anything else? Furthermore, without the glass infusion, these stones lack sufficient structural bonding to stand alone -- many will crumble in your hand without the glass infusion to give them stability. Think of a sponge; this is similar to what these "rubies" look like after the leeching process, and so extensive amounts of glass are needed to fill in the "holes" before they have enough strength to allow them to even be cut. Without the glass, most would crumble into multiple pieces! These composite rubies are now appearing with alarming frequency within the jewelry marketplace. The starting material is too low-grade to be considered a gemstone, and the finished product lacks the durability, rarity and value of a gemstone. For this reason, many gemologists consider them imitations. They have now been in the marketplace for only a few years but serious problems have already begun to surface in terms of the wearability and durability, and complaints are rising at an alarming rate. Composite "ruby" is not "treated" ruby. 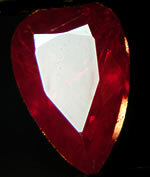 Composite "ruby" must be distinguished from treated rubies. Rubies have been routinely enhanced by a variety of techniques for almost half a century, and are well accepted within the trade. One must assume that any ruby has been heated unless there is documentation from a respected laboratory confirming that it is entirely natural. Fine natural rubies are among the rarest of all gems today—an exceptional 8.60 carat natural ruby sold at auction for $465,000 per carat! Without such treatments, as this gem demonstrated, naturally beautiful rubies would be so scarce and costly that only the world's wealthiest would be able to afford them. Treated rubies are priced according to their appearance after the treatment, and depending on the type and extent of treatment used. Various heat treatments have been used for decades. In some, extremely high heat is used and this often results in glass residues found in surface-reaching cracks. Glass-filling (or in-filling with oils) may also be used specifically to reduce the visibility of a larger crack or cracks found within an otherwise beautiful ruby; these are called "glass-filled" rubies. When present, these treatments are indicated on laboratory reports. 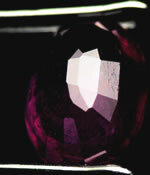 But these types of treatments should not be confused with what is being done to create a "ruby" from low-grade material, from which extraneous minerals have been chemically leeched out, leaving multiple voids that must be infused with glass in order to have sufficient stability to be cuttable. 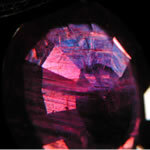 (For detailed information on how composite rubies differ from "treated rubies" in which glass is present, click here). Treated rubies with glass in fractures or in surface fissures have been around for a decade, but these new "ruby-composites" began to enter the international market around 2006, and have been surfacing with increasing frequency in the USA since around 2008. In the first part of 2009 I checked approximately 30 locations in four states, looking for composite "ruby" in retail locations. My search included department stores, mall jewelers and independent fine jewelers. I found the composite "rubies" only in one nationwide department store at that time, being sold as genuine, natural ruby! Today, just one year later, the picture is much worse: they are in at least five well-known national jewelry store chains, being sold without disclosure. So it is now entering the mainstream jewelry distribution system in the United States, as well as internet venues, auctions, and many cable TV jewelry channels. I have also seen it in local live auctions in Phoenix, Arizona, and on a cruise ship in 2009. Many of these low-end jewelry outlets have not disclosed the fact that the items they are selling are in fact a mixture of tinted glass and low-quality corundum. That creates a big credibility problem for both the consumer and for the mainstream jewelry industry. An additional cause for concern is the fact that these glass-composite "rubies" are not at all durable, especially when compared to other treated rubies, even those with minor glass present in fillings or in surface residues. Moderate heat from a jeweler’s torch will severely damage the composite "ruby." Putting the ruby in a jeweler’s "pickle" will damage these composite "rubies" within minutes (see Exhibit J below). I put a ruby in a glass and squeezed fresh lemon juice into the glass; after 48 hours the composite "ruby" was damaged (see Exhibit K below). Any ruby piece of jewelry that is taken in for repair must be checked to see if there are indications of the stone being a composite "ruby." The good thing it that it is relatively simple to learn to detect composite "ruby." Below I have provided information and photographs that will be a good start in the process of learning how to detect composite "ruby." The information below is meant as a beginning point and does not include all of the techniques that can be used to identify these stones. Also be advised that this information is for identifying the composite "rubies" seen in the marketplace at this time (2009). To examine and identify composite "ruby" you will need a good lighted loupe or a gemological microscope and a pair of tweezers if the stone is unmounted. A hand loupe alone is not sufficient because it is essential that the stone be completely lit throughout for examination. It is also important to move the light source around the stone: you will need to light the stone from the top, side and bottom and carefully observe. As you examine the stone in question, use reflected light on a facet where the facet is lit up and the light bounces off the facet (A) and not into the stone. In this example, notice how smooth the facet surface is. This is a normal ruby. In a composite "ruby," much of the surface is crazed or fractured, and these fractures have been filled with glass (B,C). In composite "rubies" not all of a stone’s facets may be crazed or fractured. The facets that are in the white reflected light (D) do not show much fracturing until you see the black fractures (dotted lines) near the right area of the reflected light. It is possible that in some cases the glass is so thick it has formed completely around the stone, so that there are no surface fractures visible in reflected light. However, the vast majority of composite "rubies" I’ve examined have shown extensive fracturing at the surface. These fracture are filled with glass. As you examine the stone with a small flashlight and shine the light through the stone, you will sometimes see one or two types of flash effects. One is a flash of yellow, green or orange in a line across the stone (E). This line may be straight or angular. Another type of flash effect I’ve seen is more regional, where a part or section of the stone exhibits a flash of one predominant color or a combination of colors, such as the blue, red at the top of the stone in exhibit F.
Most, but not all, of the composite "rubies" I have examined have contained gas bubbles. The classic look of a gas bubble is a bright sphere within a sphere. These can be tiny or large, individual or clouds of bubbles (G, H, J). Gas bubbles are in the glass and not the corundum (ruby) part of the stone. Gas bubbles do not occur "free floating" in ruby or sapphire. The illustrations below show the damage occurring to composite "rubies" in jeweler’s pickle of an hour and half. The damage to illustration K was visible to the naked eye within 30 seconds of immersion into the pickle. Illustration L was exposed to fresh lemon juice for 48 hours and then lightly heated with torch. This brief article is an introduction to three of the easiest ways to identify composite "ruby." If you suspect you have been sold a composite or glass filled "ruby," please contact AGA or use the AGA Consumer Complaint form.